In a handful of medieval Bavarian farming hamlets populated mostly by blue-eyed blondes, more than a dozen women with dark hair, dark eyes, and unusual elongated skulls [center and left in the photo above] would have stood out. . . . The remains, which date to about 500 C.E., are part of a pattern of elongated skulls found in gravesites across early and medieval Europe and Asia. The Bavarian skulls were unearthed alongside regularly shaped ones [on the right in the photo] near six modern southern German towns along the Danube River starting in the late 1960s. Few clues exist as to their identities, or how and why the skulls were stretched. Curious about the “tower-shaped” skulls, anthropologist and population geneticist Joachim Burger, from Johannes Gutenberg University in Mainz, Germany, set out to sequence their DNA. Burger and colleagues compared the DNA from tiny bone fragments in the graves with each other and those of modern populations throughout Europe and Asia. 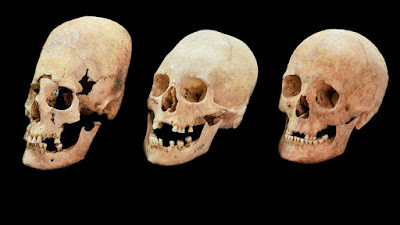 The DNA of 10 men—and 13 women with normal skulls—most closely matched modern populations in central and northern Europe. Most had genes for blond hair and blue eyes. But DNA from the 13 women with elongated skulls told a different tale. The genetics of these women matched modern populations in southeastern Europe, specifically Bulgaria and Romania, and they had genes for darker hair and eyes, the researchers report today in the Proceedings of the National Academy of Sciences. Well that's cool. Here we have a group of women from an intrusive population who also have a distinctive cultural trait: their heads were shaped in the way that many people on the steppes did, by strapping their infants to cradle boards. The excavators want these to be "treaty brides", given to secure alliances between invaders and settled people. That seems like a stretch; usually such alliances were secured by one or two royal matches, not a mass wedding of commoners. The woman could equally well have been captives taken after a victory by Bavarians over an invading force, or brought back after a foray to the east. But however they came to be buried in Bavaria, they are another sign of the great mobility and cultural mixing of that age. It really was a time of migration and upheaval.